Michele Denize Strachan MD, often called Dr Semerit by her community, has been shaped by a deep desire to create a space for the human spirit in medicine. Her training spans: Mt Sinai School of Medicine, Boston City Hospital, Columbia Presbyterian Medical Center and the University of Minnesota. Dr. Strachan pictured here with various traditional medicinal plants collected while on a guided medicine walk during a Wellness conference in Little London, JM. in 2010. Twelve years ago, seeking to redress the alienation she experienced in clinical settings, she embarked on a journey to reconnect to her roots. The elders gave her the name Semerit to guide her way to ancestral healing wisdom. 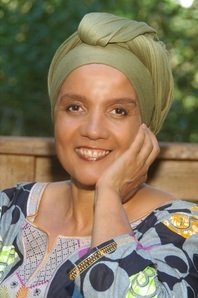 She serves as the Director of Medicine for the Cultural Wellness Center in South Minneapolis. and the gift of their being. She also maintains a practice as a part of the clinical faculty of the Behavioral Pediatrics program at the University of Minnesota. Want to know more about Dr. Strachan, her work, teachings and her personal journey? Read her "Body Best Friend Forever" blog.